Many LGBT people spent their childhood in church; many would like to come back. This book presents this and other startling findings from Andy Marin's detailed scientific survey of the religious lives and beliefs of the LGBT community. A solid basis for finding common ground in Christ. 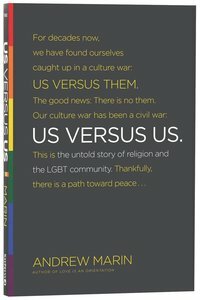 About "Us Versus Us: The Untold Story of Religion and the Lgbt Community"
:Would you believe that 86 percent of LGBT people?from the proud marcher at the Pride Parade to the quiet, closeted teen?spent their childhood in church? More than half of them left those religious communities as adults; three out of four would be happy to come back. For decades now we have found ourselves caught up in a culture war: us versus them. Good news: there is no them. Our culture war has been a civil war: Us versus Us. And there is a path toward meaningful peace. Andy Marin brings the startling findings of his largest-ever scientific survey of the religious history, practices, and beliefs of the LGBT community. Marin's findings offer clear direction for both sides of a long cultural battle to meet in the middle, sacrificing neither conviction nor integrity as they rediscover the things they have in common and the hope found in Christ alone. Original, groundbreaking research into the religious lives and beliefs of the LGBT community. Andrew Marin's life changed radically in 2000 when, during three consecutive months, his three best friends all came out to him. A self-described homophobic, straight, Bible-believing, conservative Christian alpha-male, Marin's world was rocked by the revelations of his friends. Determined to find some answers to his crisis, he made the dramatic choice to become what he calls "the gayest straight dude in America," and followed God's call to move to a predominantly gay neighborhood in Chicago and immerse himself in the gay and lesbian community. His book, Love Is an Orientation, shares the lessons learned, experiences had and lives touched in the eight years since. Expected to ship within 5 hours from Australia.